If you're still playing Red Dead Redemption, you've got a chance to make serious progress on your multiplayer rank during this week. Rockstar Games is dialing up the experience points gains for the holidays. From now until January 2nd, multiplayer activity will earn you twice the normal amount of XP. This applies to all online modes. Undead Nightmare and the other DLC will see the increased gains as well. 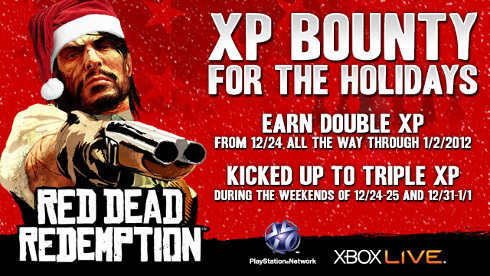 If you decide to play RDR during the holiday weekends, you'll rack up even more XP. Experience gains are triple for this weekend and will be for December 31st and January 1st as well. "Celebrate Christmas and New Year's this year by doling out buckshots to bandits and the undead alike - frontier justice is always better to give than receive. Enjoy, all," says Rockstar.